You're not alone. Others have faced - and defeated - discrimination because of diabetes. Here are some recent examples. Download a print-ready PDF of this story. Andrés just wants to go to camp. Eleven-year-old Andrés Alba of Elburn, Illinois has a strong interest in math and science. The Illinois Mathematical and Science Academy (IMSA) offers an all-day summer camp that fits the wishes of students like Andrés who want to learn more about science, math and technology. Andrés wanted to attend a week-long IMSA camp this summer, but hit a stumbling block because he has type 1 diabetes. Andrés, who was diagnosed with diabetes in 2010, lives a happy, normal life. He also happens to wear an insulin pump and a continuous glucose monitor (CGM). He is well-versed in his diabetes care, but due to his age, he needs assistance at times. When he experiences high or low blood glucose, his judgment can be affected. Andrés has attended other summer camps in the past. Support systems were put in place to help make sure that Andrés stayed medically safe at those camps. For example, someone would contact Andrés's mother, Adriana, during the day to update her about his blood glucose numbers and, together, they would decide if his insulin treatment needed to be adjusted. This system worked very well and the camp directors supported it. Based on his family's previous camp experience, Andrés expected to be able to attend the IMSA camp. This was particularly true since IMSA's regular camp program (run during the school year) fully accommodated students with diabetes. But after researching the summer camp, Adriana learned that a registered nurse would only be available until noon each day. When she asked about diabetes care in the afternoons, she was told by a few of the camp directors that they could not offer any options for afternoon care. They did not propose anything to ease Adriana's concerns. Adriana wondered who would be there for Andrés after the camp nurse left each day – and if he could even attend at all. Adriana was frustrated. And because the situation seemed unfair, she told the camp directors that she would contact the American Diabetes Association and the local media. She spoke with one of the Association's legal advocates, who shared specific information about the anti-discrimination laws that applied under the Americans with Disabilities Act and Section 504 of the Rehabilitation Act. Under the law, the IMSA camp needed to offer accommodations so that Andrés could attend. Adriana wrote a letter to the camp that spelled out this information. She also reached out to her local media about the issue. A local television station ran a comprehensive interview of Andrés and Adriana. The segment received a lot attention, especially because the reporter himself had first-hand knowledge of type 1 diabetes and really understood the issue. As a result of Adriana's efforts - as guided by the American Diabetes Association - the IMSA camp reached out to coordinate the management of Andrés's diabetes care. The camp's staff nurse, as well as the teachers who will have Andrés's in their classes, will be trained on his diabetes care. After the nurse leaves each day, the trained classroom teachers will be available.Adriana has a lot of praise for the Association staff who helped Andrés. "They provided the expert support and direction I needed. The Association gave me superior information and guidance about what to do – both from its national and local staff. Andrés is thrilled to attend this summer Thank you." Kerry Harrison of Bellingham, Washington can rest a little easier now when her daughter rides the school bus. Kiara, who is an 11-years-old and has type 1 diabetes, recently faced an episode of low blood glucose while riding the bus. Although she keeps glucose tabs in her backpack, on that particular day, Kiara didn't have enough available. The bus driver pulled over and a fellow student gave Kiara a juice box to help. Kerry took this as a warning sign. It might happen again and she needed a plan to help her daughter in case it did. In January 2016 Kerry contacted the American Diabetes Association for guidance. She wanted to ask the school district to keep a supply of glucose tabs or other fast-acting sugar source on its buses for similar situations. One of the Association's legal advocates explained that students with diabetes must be allowed to carry and access their own supplies while on school buses. But, she said that the law does not specifically require a school bus to carry its own supply of glucose tabs. So, if Kerry decided to make that request, she would be asking the school district to go above and beyond what the law requires. Kerry decided to push for more than the law required. She was looking out for the best interests of her daughter, as well as other children who have diabetes. So, after she received information and guidance from the legal advocate, Kerry contacted the school district and made the request for the district's buses to carry those supplies. After considering her request, an assistant superintendent contacted Kerry with the answer that she wanted to hear. When a student needed them for medical reasons, the student's own supplies would be the first source. But, if required, the skittles in the first aid kit would be available as an alternative. During medical situations, the bus drivers would follow appropriate procedures to ensure the safety of all students on the bus. Kerry sent a note to the legal advocate. "Good news. We won. Thank you for your help. If anyone else has the same issue, I am happy to share and help with the process." Through her advocacy Kerry proved that, with help from legal advocacy, you can win in real life, without having to win in court. Kerry also signed up as a Diabetes Advocate for the American Diabetes Association. As an advocate, she will take action and voice support for diabetes-related legislation, programs and funding. Education about diabetes and its care can make a difference. The CREST program, run by the city of Santa Monica, California, adds learning adventures to the lives of children who attend. This city-funded program provides enrichment classes, including music, art, theater and sports, to children in grades K-5. Nine-year-old Ashlynn had been participating in the program since she was five, including volleyball and track and field. But in April 2015, Ashlynn was diagnosed with type 1 diabetes and her access to CREST activities became more limited. Ashlynn's mother, Audrey, learned that the program would not train its staff to administer glucagon, which is sometimes necessary to treat episodes of extremely low blood glucose. Without trained staff, Ashlynn would not be fully protected unless her mother could be there to administer glucagon, if needed. Audrey was told that the City of Santa Monica feared a lawsuit if its staff did not administer glucagon correctly, and that was the reason for the policy. Ashlynn loved being part of the program. Audrey, a single mother who could not always be there the entire time, worried that if the CREST staff was not able to provide glucagon when it was needed, Ashlynn could not attend. This was not acceptable. So Audrey contacted the program directors and tried to educate them about diabetes care. She also stressed that it would not endanger Ashlynn's life if someone gave her glucagon, even if she didn't need it. But the program's policy still did not change. Ashlynn was only able to attend CREST when Audrey could also be there. That meant that Ashlynn had to miss out on many activities she loved. Audrey contacted the American Diabetes Association for help. She confirmed that Ashlynn had the legal right to fully participate in the program. A legal advocate at the Association gave Audrey some information and guidance. Audrey then wrote a letter to the program that outlined Ashlynn's rights and addressed the program's concerns about its legal responsibility. The directors of CREST program changed the policy and agreed to train their staff about type 1 diabetes, diabetes care (including glucagon administration) and the signs and symptoms of hypoglycemia. Ashlynn would be able to fully attend the program once again. Audrey's experience working on this issue was a positive one. She says that the program's directors were nothing but gracious through the whole process. And the result was what she wanted for Ashlynn. The Association is here to help. You can fight discrimination when you understand the laws that protect people with diabetes and can educate others about diabetes care. Sometimes information and negotiation goes a long way. 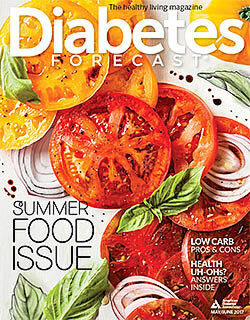 "Thank you to the American Diabetes Association's legal advocate for her time, effort and expertise," says Audrey. "When you see your child triumph through the daily struggles of managing type 1 diabetes, you will go to great lengths to ensure his or her well-being. For every parent out there who feels defeated by the weight of advocating for your child, remind yourself that there are people out there who will help. When you feel like you are going through a rough journey all by yourself, stay true to yourself and your cause. The city of Santa Monica, the American Diabetes Association and I worked positively together to achieve the best outcome for my daughter, Ashlynn. For this I am grateful."